Today Derek and I discuss the effectiveness of video emails. Most people want to build a database or contact list, but don’t know what to do with it once they have it. 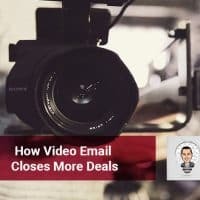 I’m going to share with you today reasons why a video message is so much more effective than a plain text format email. After all you have a database to generate referrals. That’s why a video message is more appealing. You need to stand out and seem genuine. What your actual goal should be with a video message. Derek tells me why he thinks my video messages are effective. Common excuses agent use for not using video messages. At the end of the day the secret is being personable and causal.